Nearly 400 sketchers from 36 countries gathered in Singapore July 22 to attend the Sixth Annual Urban Sketchers Symposium. The USk Executive Board is grateful to the local team, led by Tia Boon Sim and Patrick Ng, for their hard work and hospitality. Attendees experienced the warmth of the Singaporean people as they explored the "Little Red Dot" while sketching and learning. The event culminated in a sketch walk at the Singapore Management University Lawn, followed by a closing reception at the National Design Center. Sketchers contributed to the closing reception's silent auction, which raised more than $4,000 USD for scholarships for future Symposium attendees. To see sketches and photos from participants, use the hashtag #USkSingapore2015 on social media. In addition, the Symposium correspondents did an amazing job documenting the events in sketches, photos, videos and words on the Urban Sketchers blog. The New Paper, a Singapore online newspaper, covered the Symposium in its July 27 edition with an article, "Sketching Singapore in its Actual State - Artists from Around the World Draw Inspiration from S'Pore's Streets at the First Urban Sketchers Symposium Here." Join Isabel Carmona, Mercedes Carmona and Swasky in Segovia, Spain, for "Water Marks" on Aug. 5 - 8. Amsterdam and Liverpool are the locations for "Sketch It On," a series of Urban Sketchers workshops with three instructors Aug. 13 - 23. Sketch the color and tradition of Kinvara and Galway, Ireland, with Róisín Curé during "Sketching the Wild Atlantic Way" Sept. 2 - 6. "Painting in Ischia Island around Aragonese Castle," Oct. 8 - 11, will be offered in Naples, Italy, with Simo Capecchi, Caroline Peyron and Kelly Medford. Reportage sketching of the "Farm to Plate" process in Chatham County, North Carolina, is the subject of a workshop with Stacye Leanza Oct. 22 - 25. USk Germany will gather in Darmstadt Sept. 4 - 6 for sketchcrawls around the art déco area of Mathildenhöhe, a former artists' colony which is being considered a Unesco World Heritage site. 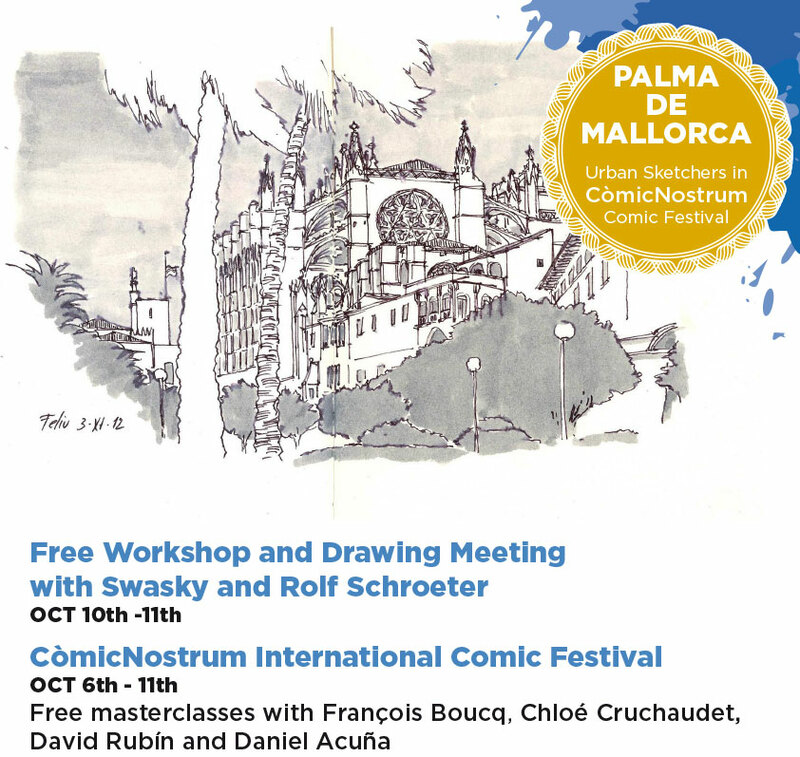 The program will include demos and mini-workshops in German and English, a portrait party and drink-and-draw fun in the evenings. "Everyone is welcome to participate! We have already 50 participants registered, both from Germany and abroad," said Jenny Adam. Marie-Judith Jean-Louis reports that USk Toronto (Canada) spent a day sketching at Niagara Falls in July. A video/slide show on the group's blog shows the action. Many Urban Sketchers groups took part in the 48th quarterly World Wide SketchCrawl, including New York (USA), Rome (Italy), Lyon (France), Strasbourg (France), London (England), Seattle (USA), Birmingham (England), Seoul (Korea) and Portland (USA). 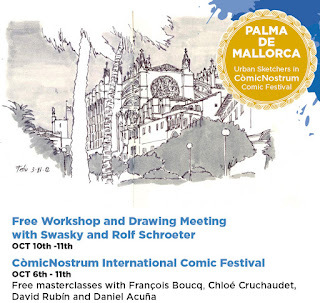 As part of the International Festival Còmic Nostrum of Mallorca, Spain, urban sketchers Rolf Schroeter and Swasky, along with local members Catalina Rigo and Feliu Renom, will lead drawing meetings Oct. 10 - 11. Open to all, the event is free, but spots are limited and will be assigned on a first-come, first-served basis. Catalina and Feliu led the same event last year. This year, Rolf and Swasky will join them. Stay tuned for updates on the event on Facebook. Shari Blaukopf reported on USk Montreal's participation in Picnic Vernissage, an event organized by the Stewart Hall Cultural Centre and Art Gallery in Pointe Claire. More than 80 sketchers, including some from Toronto, Vermont and Quebec City, participated on the sunny Sunday afternoon. Sketches from the day were hung in the gallery, where they will remain on exhibit for the summer. Tony Underhill (UK) published an excellent article in the summer 2015 edition of Leisure Painter (print and online). Based on a recent visit to Canada when he had the opportunity to sketch with USk Montreal, the article is an introduction to the Urban Sketchers organization. In addition, Tony discusses the techniques and expertise of Shari Blaukopf and Marc Taro Holmes, who led the Montreal sketchcrawl he attended. Jacek Krenz of USk Poland taught a watercolor sketching workshop in June at the International Watercolor Exhibition and Workshops in the picturesque historic town Kazimierz Dolny (Poland). "Members of The Polish Watercolorist Association and other workshop participants were happy to receive new fresh, more spontaneous approach to their painting technique," said Jacek.